, available globally, to test updates before they launch to all users on your site. When you’re logged into the account you’ve enrolled with and you visit a page with the +1 button, you’ll see the latest preview release. If you join now, you’ll be able to test the first set of updates we’ve released to Platform Preview: hover and confirmation bubbles. This will give your site’s users an extra reminder of the account they’re using to +1, as well as the fact that their +1 is public. If you have any questions, please join us in the Webmaster forum. To receive updates about the +1 button, please subscribe to the Google Publisher Buttons Announce Group. And for advanced tips and tricks, check our Google Code site. Want to test the latest +1 features? Today we’re introducing a new option for webmasters who want to be the first to know about changes to the +1 button. Enroll in the Google+ Platform Preview, available globally, to test updates before they launch to all users on your site. When you’re logged into the account you’ve enrolled with and you visit a page with the +1 button, you’ll see the latest preview release. and earlier this year the Page Speed Online API to provide developers with specific suggestions to make their web pages faster. Last year we released mod_pagespeed, an Apache module, to automatically rewrite web pages. To further simplify the life of webmasters and to avoid the hassles of installation, today we are releasing the latest addition to the Page Speed family: Page Speed Service. here at Google is that fast is better than slow. We keep speed in mind in all things that we do, and the +1 button is no exception. Since the button’s launch, we have been hard at work improving its load time. Today, we’re proud to announce two updates that will make both the +1 button and the page loading it, faster. To generate the new async snippet, use our +1 Configuration Tool. Below, you’ll find an example of the code, which should be included below the last <g:plusone> tag on your page for best performance. section of Webmaster Tools. Fear not; you can now find it under its new name, URL Parameters! Along with renaming it, we refreshed and improved the feature. We hope you’ll find it even more useful. Configuration of URL parameters made in the old version of the feature will be automatically visible in the new version. Before we reveal all the cool things you can do with URL parameters now, let us remind you (or introduce, if you are new to this feature) of the purpose of this feature and when it may come in handy. URL Parameters helps you control which URLs on your site should be crawled by Googlebot, depending on the parameters that appear in these URLs. This functionality provides a simple way to prevent crawling duplicate content on your site. Now, your site can be crawled more effectively, reducing your bandwidth usage and likely allowing more unique content from your site to be indexed. 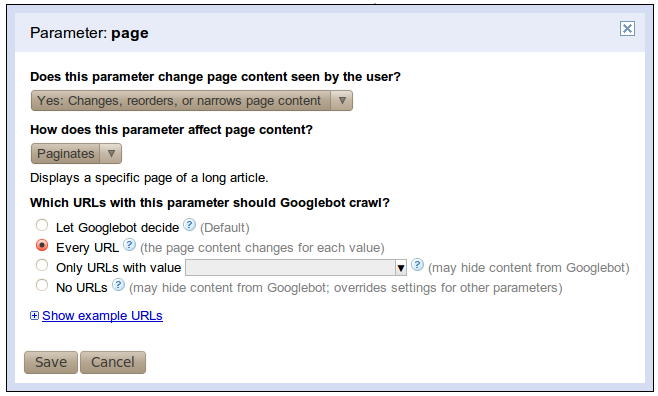 If you suspect that Googlebot's crawl coverage of the content on your site could be improved, using this feature can be a good idea. But with great power comes great responsibility! You should only use this feature if you're sure about the behavior of URL parameters on your site. Otherwise you might mistakenly prevent some URLs from being crawled, making their content no longer accessible to Googlebot. We also added the ability to provide your own specific value to be used, with the “Only URLs with value=x” option; you’re no longer restricted to the list of values that we provide. Optionally, you can also tell us exactly what the parameter does--whether it sorts, paginates, determines content, etc. One last improvement is that for every parameter, we’ll try to show you a sample of example URLs from your site that Googlebot crawled which contain that particular parameter. Imagine that you were to tell Googebot to only crawl URLs where “trackingId=aaa125”. In that case Googlebot would not crawl URLs 1 and 2 as neither of them has the value aaa125 for trackingId. Their content would neither be crawled nor indexed and none of your inventory of fine skirts would show up in Google’s search results. No, for this case choosing a representative URL is the way to go. Why? Because that tells Googlebot that when it encounters two URLs on the web that differ only in this parameter (as URLs 1 and 2 above do) then it only needs to crawl one of them (either will do) and it will still get all the content. In the example above two URLs will be crawled; either 1 & 3, or 2 & 3. Not a single skirt or trouser will be lost. Great WebWizard: This is very similar to the sortOrder attribute. You want the crawled URLs of your listing to be sorted consistently throughout all the pages, otherwise some of the items may not be visible to Googlebot. However, you should be careful which value you choose. If you sell books as well as shoes in your store, it would be better not to select the value ‘title’ since URLs pointing to shoes never contain ‘sortBy=title’, so they will not be crawled. Likewise setting ‘sortBy=size’ works well for crawling shoes, but not for crawling books. Keep in mind that parameters configuration has influence throughout the whole site. They seem like new pages (the set of items are different from all other pages), but there is actually no new content on them, since all the blue skirts were already included in the original three pages. There’s no need to crawl URLs that narrow the content by color, since the content served on those URLs was already crawled. There is one important thing to notice here: before you disallow some URLs from being crawled by selecting the “No URLs” option, make sure that Googlebot can access the content in another way. Considering our example, Googlebot needs to be able to find the first three links on your site, and there should be no settings that prevent crawling them.